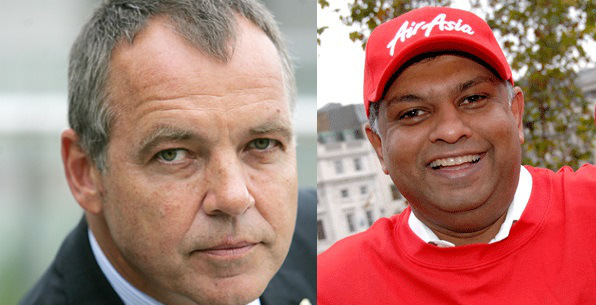 Left: Mr Christoph Mueller, CEO of MAS Right: Tan Sri Tony Fernandes, CEO of AirAsia Group. Both are great CEOs of all times. Great men think alike and also sing the same tune at the right time! The little napoleons in Khazanah would like us to believe that MAS employees have been gifted with Mr Christoph Mueller as their CEO. Thanks to the little napoleons in Khazanah. For the record, after some 15 years that MAS had to encounter with the decisions of the Ministry of Transport during the 4th Floor Administration pertaining to the operations and the notorious MAS-AirAsia Share Suap Swap, no one except for a few top management in MAS would ever dream to venture into calling for collaboration with AirAsia because they were fully appraised of how MAS was “CANNIBALISED”. Mr Mueller, of course, was head hunted by the little napoleon in Khazanah to turn around MAS. For whom? Mr Mueller’s appointment as CEO of MAS is supposed to take effect in July 2015 but it was fast track to 1-5-2015 for reason best known to the little napoleons in Khaznah. What a lucky expatriate! On 3-6-2015 out of sudden and, of course, very innocently Mr Mueller told the press that “MAS collaborating with AirAsia on things like maintenance, repair and operations”. Mr Mueller’s timing was perfect and again, it must be said that the said statement was innocently made and properly timed. Please read HERE. 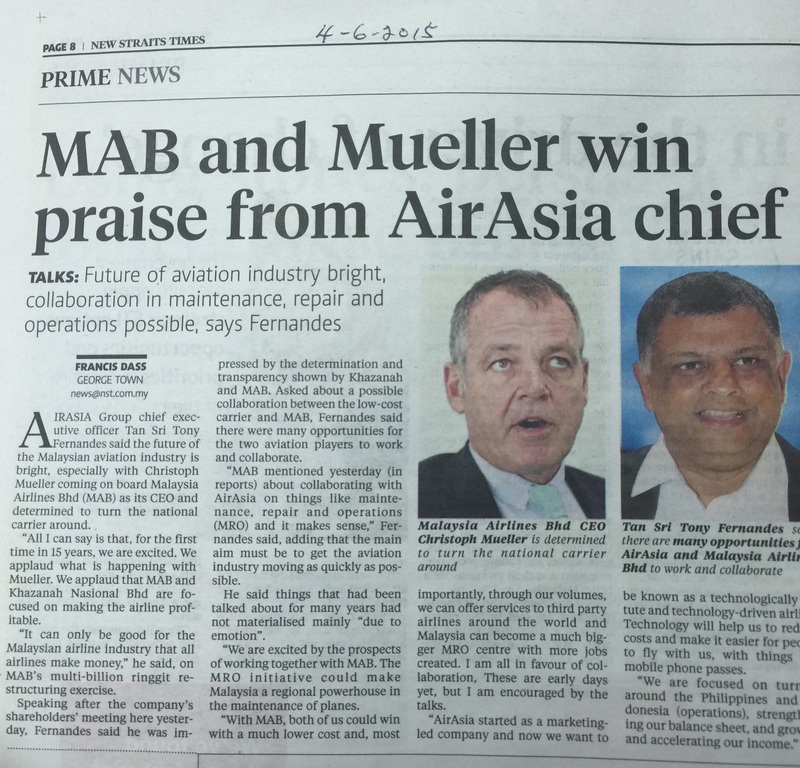 On 4-6-2015 Mr Mueller was accorded with praises from non other than Tony Fernandes, the guru of aviation industry in the world. Is it a necessity for MAS to collaborate with AirAsia on maintenance, repair and operations? Yours truly is certain that all of you must have heard of the MD of Khazanah, Tan Sri Azman Mokhtar‘s great plan to rescue MAS during the share swap by his famous grand idea of “Comprehensive Collaborative Framework” (CCF). The famous CCF will be dealt with in details in the remaining parts of this posting. Mr Mueller came into MAS for about a month ago and he did a fabulous job of transforming MAS starting with his first task by axing 6,000 employees of MAS. It will be interesting to note how could Mr Mueller evaluate the performance of the 6,000 employees in a matter of days. He was formerly appointed as CEO in May 2015. Mr Mueller must be the smartest of all CEOs to be able to make the said evaluation in such lightning speed. He has the quality which none of us, Malaysians, have and for that matter, no other expatriates have such great quality. En Azahari Dahlan, the former Head of AirAsia Engineering, a minute department of AirAsia if compared with MAS. 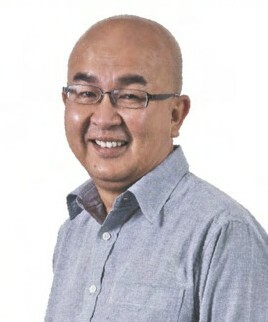 He was head hunted during the notorious share swap and put in the position of CEO of MRO in MAS. However, he didn’t, of course, terminate top executive like En Azhari Dahlan, the CEO of MRO who was, of course, head hunted from AirAsia to MAS during the height of the notorious Share SUAP Swap. Azhari is the most highly qualified aviation engineer in the whole of Malaysia. Mr Mueller must have been informed of and immensely impressed by the sought after quality of En Azhari Dahlan, who was previously heading a minute engineering department in AirAsia if compared to MAS MRO. Please do not call or describe Mr Mueller as a TERMINATOR because he was head hunted by the little napoleons in Khazanah to be the saviour of MAS! Therefore, we must obediently think that Mr Mueller is a SAVIOUR of MAS! Mr Mueller had to understand the history of how AirAsia came into being and how MAS was treated during the 4th Floor Administration. Thereafter, the MAS-AirAsia Share SUAP Swap that was SECRETLY hatched by the little napoleons in Khazanah in August 2011. The said Share Swap had to be hatched secretly because the said share swap involved our national security. If it was known before the announcement Malaysia may be invaded by foreign powers. Thanks to the little napoleon in Khazanah for protecting our national interest! AirAsia became extremely powerful during the 4th Floor Administration . MAS could operate freely. The 4th Floor Administration had imposed Floor Price. It was normal for government to impose Ceiling Price to protect consumers but in the case of MAS it was Floor Price. Who was the 4th Floor Administration trying to protect then? Lets start off with Rural Air Service (RAS) in Sabah and Sarawak. MAS was entrusted to do a national service to operate RAS in Sabah and Sarwak. certain personalities behind AirAsia wanted to take over RAS. It started with a private company known as Fly Asian Express Sdn Bhd aka FAX to take over RAS. At the material time, FAX had no aviation background. 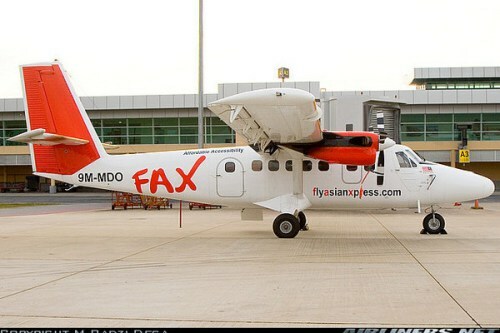 The famous FAX logo before its name changed to AirAsia X Sdn Bhd. Now AirAsia X Bhd. The 4th Floor Administration arbitrarily took away RAS was from MAS and awarded to FAX with a subsidy of about RM250 million for two years contract. MAS only received a subsidy of RM125 million, HERE & HERE. Please also read HERE. But FAX could not perform the contract and too many complaints received from the Sabah and Sarawak State Government and other agencies. FAX had no engineering expertise which had resulted in 6 of the 14 Fokker aircraft grounded due to un-airworthy and another 1 being cannibalised for spare parts. The 4th Floor Administration was under tremendous pressured in and out of Parliament and it had no alternatives but to prematurely terminate its RAS contract and ask MAS to take over RAS. However, although RAS was prematurely terminated with 1 years and a few months left, the 4th Floor did not bother demand the refund of the RAS subsidy of RM250 million on pro-rata basis. Further, as a result of the un-airworthiness of the aircraft and the cannibalisation of one for spare parts, MAS was forced to pay RM35 million to put them right. Of course, the little napoleons Khazanah did not bother to instruct MAS to make any demand of the RM35 million from FAX, now AirAsia X Bhd. This was during the time of Senator YB Datuk Idris Jala, who was then the CEO of MAS/. Please read Why DCA failed to withdraw AOC for FAX/AirAsia X, HERE. Despite the very bad track records of FAX, in September 2007 after having changed its name to AirAsia X Sdn Bhd (AAX), DCA blindly rewarded AirAsia X with the Air Operation Certificate (AOC) to do long haul service. Now it is able to owe PSC and other charges to Malaysia Airport Holding BHD (MAHB) with impunity. Rumours have it that AirAsia as a group owed more than RM200 million PSC and other charges to MAHB. For background story please read HERE. Yours truly hopes that Mr Christoph Mueller will spare a few minutes of his precious time in the planning of collaborating with AirAsia to read this posting. Thank you Mr Mueller for your time if you care to read this posting. Please stay tuned for Next Change / Akan Datang Part 2 soon also for the benefit of Mr Christoph Mueller’s grand scheme. Only clueless white elephant in MAS will suggest collaboration with AirAsia. He is a genius to through the records of 20,000 staffs and concluded that 6,000 had to go. We know that the Botak Azhari is a deadwood & planted as a CEO in MRO. The white elephant should go through the books of MRO then he will know what the Botak has been doing. Most probably this Mat Salleh had no knowledge of the Pariah. He had also not done his homework before he open his big mouth. The rule of the game is once beaten many times shy. I believe no other CEOs of airline would want to dela with the pariah without a hundred mile pole. Do you know that Christoph Mueller used to work as a German Army Intelligence officer? Think about it. For MAS problem, one good analogy. Your mercedes has broke down. You bring in a German specialist to repair the car. But, instead of repairing, he recommends to buy a hyundai. But at the end, your mercedes is still unservicable. Wonder how much MAB CEO is earning? He used to earn £5 million per year in Aer Lingus. In MAB, surely more than that. Roughly RM2 million per month or RM20 million per year. Maybe Khazanah may say it is not public’s money paying MAB, Khazanah is paying. But where is Khazanah getting their money?? Does Khazanah do any business? Or they are just a management Co for the Govt? And you do VSS for the staff, who mainly earnd RM2000 to RM3000 per month. Next, he appoints consultants (all Germans), who are his close friends. Unfortunately 1 pased away recently. And the CEO spent most of his time at his friend’s dying bed. But has he visited any staff who had passed away? The consultants have recommended to reduce staff. They have reduced so much that there is a lot of overtime. Some staff have been working non stop. It has been reported that an engineer in Kota Kinabalu had passed away due to tiredness. He was working continuously for 3 weeks. Has DCA or ministry of HR investigated this? Back to the consultants. Where is the Corporate Governance? Were there open tender? These individual consultants are paid millions. The best part is that the recommendations are the same as what had been done before. Probably good to do audit check. There is no business plan for 2016. And its already the new year. Still revising? I guess the plan is for 2015 and 2016 to look very bad so that 2017 to look good. So, the mat sallehs have done recovery. Well done Malaysians. A Malaysian national carrier has lots of mat salleh big bosses. Where are the Malaysians? No talents from Talent Corp? And these mat sallehs are earning more than RM100,000 per month. You can employ 1000 staff for 1 mat salleh. At the town hall on 14 Jan, Christoph had admitted he had wrongly let go of experienced and qualified engineers to maintain A380. So, who are maintaining the A380 now? Is that why the A380 flights are always delayed now?